If you’re looking for a new and exciting way to wanderlust, why not explore Mediterranean yacht destinations? Some of the most iconic coastlines and breathtaking seascapes are found in the Mediterranean. You can get a private front row view to places that are generally booked and expensive to explore when you arrive by yacht charter. Setting up a yacht charter is pretty easy, especially with the tips I have added below. Here are five of the most popular places to arrive by sea. Warm soft breezes and picturesque ports invite travelers to destinations all over the Mediterranean. Spending a day at sea and arriving at beautiful bays for lunch, shopping, and photo taking might be one of the most memorable experiences you can have. If you’ve been daydreaming about photos of the Mediterranean that you’ve seen on Instagram or Pinterest, you will definitely want to consider these Mediterranean yacht destinations. Pro Tip: Rough Guides makes excellent travel guides for the destinations listed in this post. I highly recommend you get them. They are very inexpensive. Destinations like the Ionian, Cyclades, Saronic and Sporades Islands as well as the Dodecanese offer breathtaking landscapes and culture. You could sail these seas for weeks and still find new places to explore. From ancient myths and history to incredible food, there is a variety of interests among the Greek Islands that offer something to just about any type of traveler. It’s no secret that Croatia is the leading destination for yacht charters. With its crystalline waters and gentle summers, it’s hard to not get carried away by the breeze and into tranquility. By day, ancient history and mind blowing landscapes will take you back in time. And by night, you can enjoy the peaceful sounds of quiet bays, or jump right into the exciting nightlife. The contrast of its metropolitan meccas and national parks are exciting and offer a bounty of things to do when you’re on land. And if you’re a Game of Thrones fan, then you’ll also enjoy exploring the filming locations in Dubrovnik and Split. Some say there is no comparison to the sights, tastes and culture that Italy offers. But arriving at this by sea is an entirely different way to experience one of the world’s most sought after destinations. Places like the Tuscan Islands, Naples, Sicily, Sardinia and the Amalfi Coast take on a whole other life when you trade the traffic for the embrace of the exhilarating sea breeze. Each destination has something different to offer the wide-eyed sailor who arrives ready for adventure. And you can bet it will involve great food and wine. Digestivo – a class of drinks that are enjoyed after a big meal with the aim of settling the stomach and helping you feel not-quite-so-full like limoncello, grappa, amaro, cynar, amaretto, and sambuca. You might think that sailing into the Balearics of Spain means you have to be ready to party. With towns like Ibiza and Majorca, it’s easy to see why. But these areas actually offer many quiet, off the beaten path places where sails from around the world gather to bask in their beauty. You’ll find tranquility at the island national park of Cabera and powder white sand beaches at Formentera making the Balearics a destination for natural beauty and wildlife. Still quite underrated by most western travelers, Turkey is one of the most beautiful destinations on earth! Gentle turquoise waters find cool breezes that will bring you to bays teeming with history, incredible cuisine, spectacular landscapes and ancient ruins. The Peninsula of Callipolis down to Antalya offers a coastline with countless bays and inlets to find tranquility and relax. Manti – Turkish ravioli filled with minced meat and topped with garlic yogurt, melted butter, dried mint, ground sumac and red pepper powder. Setting up a private yacht charter from the US is really quite simple. And, it’s comparable in price to spending ten days at Disney World. You should book your flights to the UK when flight prices are low. A great way to find out when low fares come out is to set up email notifications to Cheap Air, Airfare Watchdog and Scott’s Cheap Flights. Then, when your desired flights come available at a good price, you can book them! You can usually book your European flight with the yacht charter company who offers the lowest price. Be mindful of the direct flights to the Ionian from UK airports. You should plan to fly from the US to any of these airports in order to get a flight to the Ionian. Of course, it’s likely that you’ll have to spend a night in the UK before you make your second leg to Greece. You might like to spend a couple of days exploring London or Manchester if you’ve never been! You know the Mediterranean as a place of ancient history, incredible ocean views, delicious food, amazing coastlines and fascinating myths. Exploring this region by yacht will allow you to experience all of these iconic points from the serenity of the sea and the freedom to adventure from bay to bay at will. You’ll find that your Mediterranean travel story will evolve out of spontaneous adventures, from cobblestone streets lined with shops and cafes, to landscapes you only imagined to be real on postcards. Consider the adventures to be had at the various Mediterranean yacht destinations I’ve listed above. Quiet bays laced with tranquility and beauty, exciting nightlife, ancient cities, delectable cuisine, history and culture await. 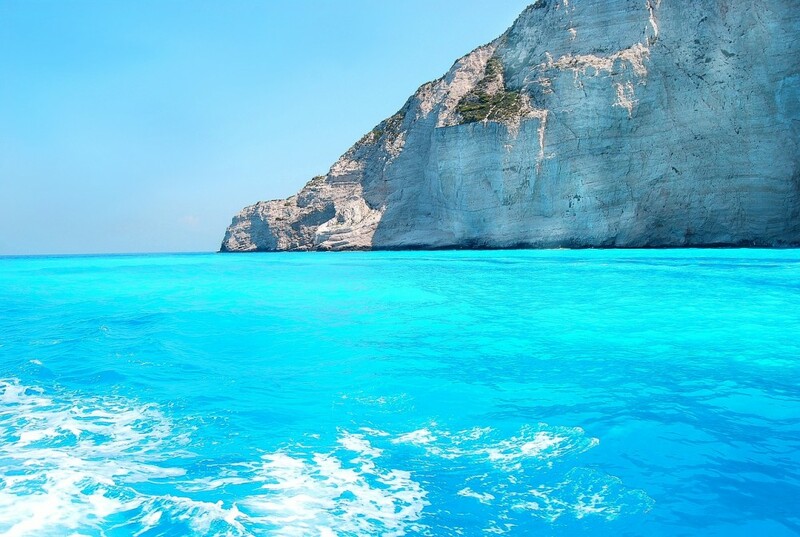 You just need to let yourself be carried in on the warm breezes along the turquoise waters of the Mediterranean seas.